The ultimate guide to finding the best paella in Spain. I found it! After searching far and wide through Basque Country, Andalusia, Galicia, Navarra, Madrid and Valencia; the Costa del Sol delivered the finest and tastiest paella I have ever eaten. The restaurant is situated in a little coastal town called Nerja, which is about an hours drive from Malaga airport. 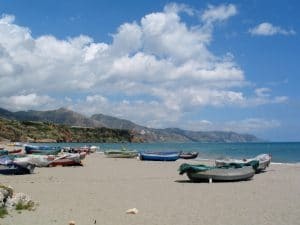 In Nerja, there is a beautiful beach called Burriana Beach. Those who have been will know what I’m talking about; crystal clear blue waters, great jumping rocks and coastal caves, white sand, with stark white villages toppling down the majestic mountains which back the coastline. Did I mention it’s always sunny? And the vibe of the community is mixed with friendly locals and European tourists basking in the sunshine and eating helado. Sounds like the dream right? The best paella can be found at a restaurant on Burriana beach called ‘Ayo’. Francisco Ortega Olaya is the legend who owns this restaurant and makes this tasty paella and is practically a celebrity in Nerja. Each day Francisco makes a huge batch of paella in an even larger hot pan, not to mention the boat oar that he mixes it with. It’s great because the paella is cooking out on the sand where all the tables are and you can watch and see how they do it, which is a bonus. Another bonus is that if you order paella, you are eligible to unlimited servings! And it’s only 6.5 Euros! Yes, one would say they are in paella heaven. How did I discover ‘Ayo’? I was studying Spanish for three months at the ‘Escuela de Idiomas Nerja’ which was organised through Abbey Language Travel. It was by far the best three months I could have asked for, mainly because I discovered this tasty paella – just kidding, it was more than that. I had never spoken Spanish before and I came away with solely Spanish speaking friends who live in Nerja. My language skills sky-rocketed. I stayed with a local Andalusian family who made me not only very fat but they couldn’t speak English, so I was forced to speak Spanish, which was ideal. Not only did I learn the language, but I was also fully immersed in Spanish culture which in my opinion gives you a richer understanding of the language. So, if you are like me and want only the best paella in Spain, look no further because I’ve got you covered. Not only is ‘Ayo’ paella tasty, but it is also a great cultural experience.